Everyone calm down! Comedy is back at the Bookshop and will continue to be here on the last Friday of EVERY month. It's still just a fiver to get in (bring your own refreshments). This month we welcome back the brilliant DAVID MILLS, who'll be performing a preivew of his 5 date Soho Theatre show "Don't Get Any Ideas". "He's charmingly bitchy, un-PC and very funny. No one is safe from his sharp tongue as he rants about seemingly minor issues with a huge amount of wit. A class act." Tickets for the Soho Theatre Shows are HERE (£10), but if you want to watch this superb stand-up in the intimate surroundings of the Big Green Bookshop aswell, then come along on January 30th too. There is stellar support from Damian Kingsley and more acts tbc. Buy tickets early, as we fully expect this will be a full house! The Folio Prize is the first major English language book prize open to writers from around the world. Its aim is simple: to celebrate the best fiction of our time, regardless of form or genre, and to bring it to the attention of as many readers as possible. This is one of the UK’s biggest prizes (the winner will receive £40,000) and although this is only its second year, if last year is anything to go by, we have a real treat in store. Last year George Saunders’ phenomenal Tenth of December was crowned the winner. Such is the strength of this list we have decided to do a FOLIO PRIZE BOOK CHALLENGE. The challenge is to read as many, if not all of the shortlisted titles, before the winner is announced in March. We'll open until 7pm on that Thursday so people who want to take part can come along to say hello, take home one or more of the titles, and enjoy some rather lovely wine. Obviously, you don't have to come along on the Thursday if you want to take part. Over the next six or so weeks those taking part will make a concerted effort to read as many of the eight shortlisted books as they can. The group will meet again on Sunday March 22nd the evening before the winner is announced to discuss each of the books. After a heated debate, and a glass or two of wine, the group will vote for whom they think should win. We'll then announce our findings and wait with baited breath for the official announcement the following day. •For a one off payment of £30, we will be a lending library, where you can borrow each of the books one or two at a time. You can also keep your favourite book after the ceremony. •We will offer a discount of 20% on the shortlist for Book Group members. •A group of you could share the cost, and swap them between yourselves. However you decide to do this, we will do everything we can to make the books accessible to you. The important thing is that you're able to join in. It's a real challenge, but if you think you're up for it, come along. We’ll be doing a similar challenge when the Baileys Women’s Prize for Fiction shortlist is announced in April. The Big Green Bookshop has always supported local schools to promote reading for pleasure. Over the last few years we’ve begun to deliver more educational projects with Haringey schools (see the schools page of our website for examples). We now need to set up a not for profit social enterprise company to develop our educational work. The company will be called Big Green Bookshop Education. We will promote literacy and reading for pleasure, through working with local schools, libraries and other partners. · Patron of Reading: Haringey Chapter: we have set up a local branch of the national Patron of Reading scheme which places authors in schools to inspire reading for pleasure. We now need to raise funds to help more schools work with these amazing authors. · Arts Award literacy projects: 36 children and young people so far have gained a national qualification through our innovative local literacy initiative: High Street Stories. We want to extend these opportunities to many more local schools. · Supporting other local initiatives: The new company will enable us to build on our track record of supporting literacy projects in Haringey and beyond. · Donations of £10 - or whatever you can afford. In return you will be acknowledged as a foundation patron on our website. We’ll keep you informed of our achievements and progress. · Offers of in-kind support are also very welcome, for example, design, marketing, specialist advice and expertise. What will we do with your support? 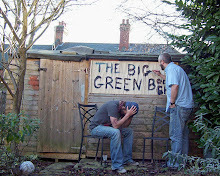 · Meet the initial expenses of setting up and registering the Big Green Bookshop Education social enterprise (we expect this to be a Community Interest Company). · Set up a company website - which we will initially use to coordinate the Patron of Reading: Haringey Chapter initiative and recruit schools and authors. · Hold a launch event for the Patron of Reading: Haringey Chapter to recruit new authors and schools to the scheme. · Plan and deliver new literacy projects, for example, shared Patron of Reading projects which enable more primary schools to benefit from the scheme. You know when you go into a bookshop and you look at all those lovely books on the shelves. I always think it's important to recognise some old familiar titles, when you do this. It puts you at your ease, and makes you more likely to spend time looking through the rest of the selection the bookshop has. When we first opened the huge corporate monster that is The Big Green Bookshop, one of the things we wanted to do was find books that deserved to be stocked but for some reason were no longer seen so much on the shelves of the bigger shops. Things like (in no particular order), The Bone People by Keri Hulme, Hotel Du Lac by Anita Brookner, books by Margaret Drabble, Nancy Mitford,Ngaio Marsh and Georges Simenon, The Third Policeman by Flann O'Brien, the Professor Branestawm books (until the Christmas special on the telly), Olga Da Polga, The Highwayman by Noyes and The Giant Jam Sandwich. Anyway, we'd like your help please. We'd like to revisit this and reintroduce some "lost" gems to our bookcases. Can you suggest books that you don't see so much in bookshops any more that you think deserve a place? If we get enough suggestions, we'll put together a promotion to display in the shop. 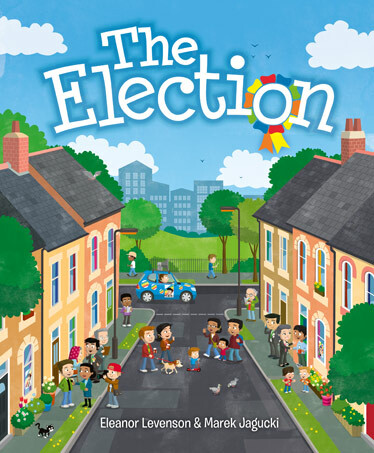 Ellie Levenson has published (I think) the first book for young children on General Elections. And it's brilliant! The Election was crowdfunded by a Kickstarter and Ellie got the idea for the book, after her daughter started asking her questions during last year's local elections. The book tells the story of young Alex. His parents want the stripy party to win and Alex joins them as they deliver leaflets and posters to their neighbours. One of his best friends is Evie, and her parents support the spotty party. There's a TV debate and canvassing up and down the street. And Alex goes to the polling station with his parents when they vote. Ellie says "It was really important in The Election for the parties not to be recognisable as any real parties because it's about process rather than policy. So there's the spotty party and the stripy party. The main moral of the story is tolerance – only one party wins, and you'll have to read the book to find out which – but the children remain friends anyway"
I've been lucky enough to read the book and it's ideal for inquisitive children and a really useful tool to help explain an important aspect of crazy crazy world of UK politics. It's published on January 5th and we'll be getting copies soon after that. It's only £7.99 and available to pre-order here. We'll post it out as soon as it arrives (FREE P+P).